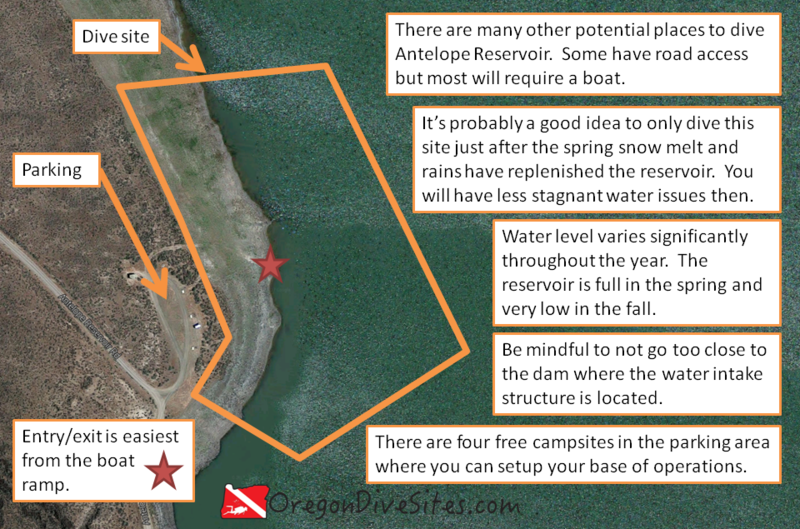 If you’re looking for a remote dive site on the edge of the Oregon high desert, then Antelope Reservoir might be exactly what you’re looking for. This dive site won’t win any awards for having interesting stuff to see underwater or for being deep (at its max depth, the reservoir is 25 feet deep!). The water is not very clear and is stagnant in the summer. There are a few trout in the lake but otherwise there isn’t much going on here. So why would you bother going all the way out to the Jordan Valley by Jean Baptiste Charbonneau’s grave to do some SCUBA diving? Good question! The only real draw for this site is that it’s a little bit of water in a great big desert where you can do a little SCUBA diving to check it off the list of places to go diving in Oregon. Antelope Reservoir is way out in the Jordan Valley on the eastern fringe of Oregon. You can’t get much farther away from the ocean in the Beaver State. The dive site is pretty boring but that’s not really the point of diving here. The reason you would haul all your gear out here is because this dive site is in the middle of the desert. Why not check out a dive site off the beaten path? From the Ion Highway, look for signs for Antelope Reservoir. The road is called Antelope Reservoir Road although sometimes the road sign is missing. Head up the hill until you see the lake. The parking area is just north of the dam. The last time we were here, the parking was free. There are four free campsites here, too. Let’s get this out of the way: this is a lousy dive site. We wouldn’t bother coming out here to do a dive except for the novelty of diving in the middle of the Oregon high desert. The reservoir is shallow and often has less than ideal water conditions. The drive is very long from any major population centers. There really isn’t anything to see under the lake. If you go to dive this site, we suggest going out and doing some compass skills (trench patterns, box patterns, etc.) to give you something to do. Who knows? You might find an abandoned sunken car or a lost fishing rod. The main thing to watch out for here is getting too close to the water intake structure on the dam. You don’t want to get sucked through and end up downstream in small pieces. Just walk down the boat ramp until you get to the water. This is a shore dive although you could bring a boat and do a little boat diving here, too. The lake can get a few waves from the wind occasionally. In the winter, the lake ices over sometimes. In the summer, the water gets very low as you get closer to the fall. You’ll be lucky to get 10 feet of viz here. The bottom can be stirred up so stay clear of it. During spring snow melt, the water temperature will be near freezing. At the end of a long hot summer, water temps can be up in the 60s although usually will be in the 50s. Late spring or early summer is the best time of year to dive this site. Later in the summer and fall, the water level will be very low and the water will get nasty from being stagnant all summer. In the winter, this is usually a bitterly cold place to be. If the reservoir is completely full and you really search for it, you will be able to hit 25 feet. Expect more in the neighborhood of 15 feet. This is an altitude dive. The lake is at about 4300 feet. Plan accordingly. We rate this as an intermediate dive because of needing altitude training to dive this site. Depending on the water level, you might need to walk several hundred feet. You’ll want to kick away from shore at least 200 feet to get a little depth in the water column. Avoid the water intake structure on the dam. Don’t become fish food! There are other potential places to explore on Antelope Reservoir although we don’t know why you would spend the time and resources to do so. Take a quick dip at the boat ramp and check this site off your list of Southeast Oregon SCUBA diving sites. The closest place for any sort of services is in Boise, Idaho a few hours away. This is a very remote site. The last time we were here, there was very patchy cellphone service. You need to be fully self-sufficient. There might still be a restaurant in Jordan Valley, Oregon. Otherwise you have several hours to go to find any sort of services or food. There are a couple free campsites right at the boat ramp. Otherwise there is a LOT of BLM land out in Southeast Oregon where you can camp for free. We don’t know of any hotels nearby.